3D printing is well used for architecture. We can see that 3D printed houses are becoming a reality and that 3D printing could become a common manufacturing technique in architecture. Additive manufacturing can also be used for other application in this sector, and that is precisely what we can see with, Valoptim, a property development company which decided to work with us to 3D print architectural models. Additive manufacturing can actually be used on different levels and for various projects. 3D printing allows developing projects that are highly customizable and Valoptim decided to make the most of this 3D technology. This manufacturing technique can be used to create models of houses or flats. This is the project developed by Valoptim, a property development company! Indeed, Valoptim decided to offer 3D mock-ups to their customer when buying a new flat. This way, future owners get an accurate model of their home, in order to materialize the new flat they purchased. This project is actually a great technique to improve the customers’ relationship. It is a good way for them to plan their lives in this future home. By choosing our online 3D printing service, Valoptim has a “made in France” project! At Sculpteo, we are offering a wide range of 3D printing materials and finishes allowing our customer to make the most of the 3D printing technology such as Valoptim did. Additive manufacturing is perfect for these kinds of projects. These French property developers needed a customizable and small-volume production technique. Thanks to our qualitative catalog, they easily 3D printed their projects. But this technology can also be used in many different sectors such as fashion, automobile or in the medical sector. If you need a great manufacturing technique for your project: upload your 3D files right now on our online 3D printing service. The 3D technology can be used for visualization, simulation, prototyping or even production. We can say that 3D is definitively a great asset for real-estate and architecture. By using 3D modeling software for architecture, it is possible to get a better visualization of a project and to try new ideas. It is even used to develop immersive visits using virtual reality! At Sculpteo, online 3D printing service, we can see that the 3D printing technology is more and more used for architecture projects. 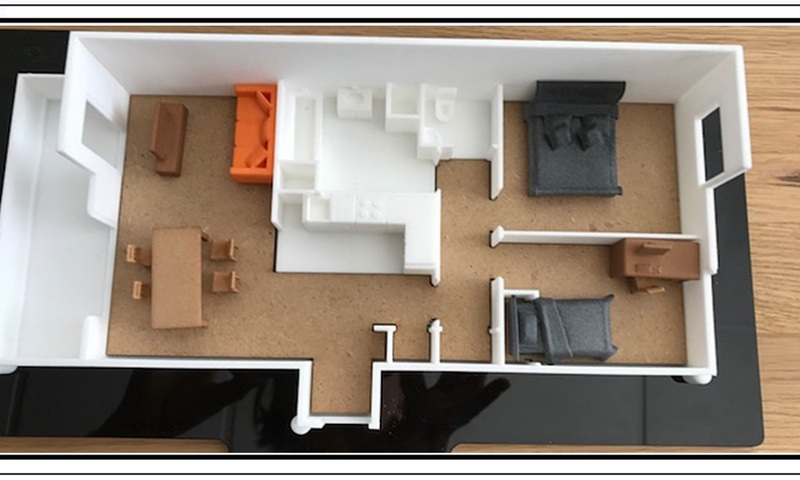 We saw told about one of them recently on our blog, with the example of Gaëtan Le Penhuel & Associés, 3D printing architectural models in a short lead time and at a reasonable price. If 3D printing for architecture is a great asset for prototyping and architectural models, it is also used for production. Indeed, additive manufacturing is starting to be used to 3D print real houses and architectural structures. This technology is really promising for the future of architecture. Additive manufacturing was a great asset to the construction sector. Now, property developers such as Valoptim can easily use this technology in order to improve their customer experience and allow the customer to be prepared for their new home! Do you want to give life to your ideas using additive manufacturing? Upload your 3D files right now and get your 3D printed parts in a few days! If you want to get more information about our 3D printing service and know what is happening in the 3D printing world, don’t forget to subscribe to our weekly newsletter.